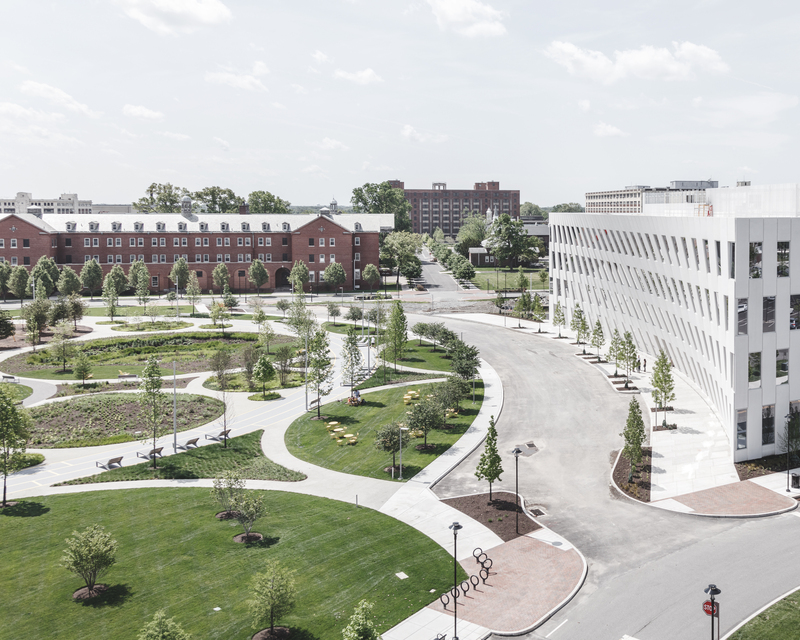 As the first building to be designed by Bjarke Ingels Group in the city of Philadelphia, the four-story project has been envisioned to communicate and connect with Central Green. Its east façade is curved and bows inward at the ground plane in a gesture reminiscent of the park’s circular running track, activity pods and planting vignettes. Its cornice, in contrast, remains straight and aligns with the original orthogonal street grid prevalent in the immediate neighborhood. These gestures result in a complex double curved surface which is built of alternating architectural sand-blasted white precast concrete panels and fenestration. The “net” of heavy architectural materials seems to defy gravity as it reaches into and embraces 12th Street and Central Green. The building is certified LEED® Gold. The building’s design can accommodate either a single or multi-tenant layout.